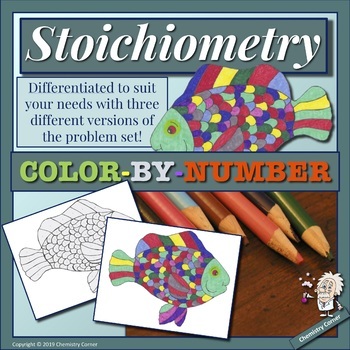 Stoichiometry Color-By-Number! Add art and creativity to your review lesson! Students work ten problems, choose the correct answer, and color their masterpieces according to the color beside the correct answer. For early finishers, I let students “make it their own” by adding a background, and coloring parts of the drawing that don’t have numbers. 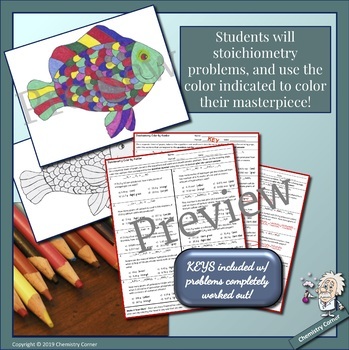 This is a great review assignment that will have students reviewing stoichiometry in a whole-brain activity. Great for keeping students on task for sub days. 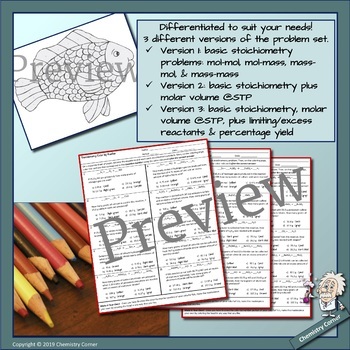 Students should be very familiar with nomenclature, calculation of molar mass, balancing chemical equations, stoichiometry, limiting & excess reactants, and percentage yield. Just Print and Go! Everything is ready for immediate use in your classroom.